“Whatever is not yours: let go of it. 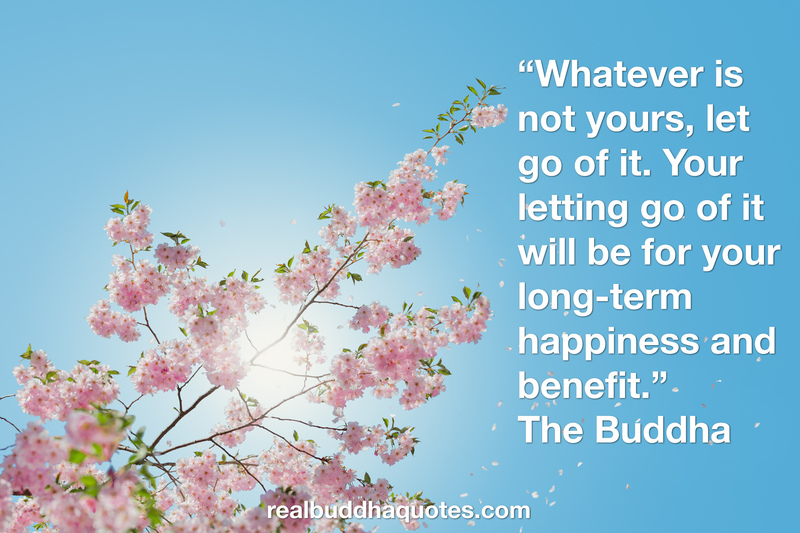 Your letting go of it will be for your long-term happiness and benefit” is a genuine quote from the Buddhist scriptures. It’s from the Na Tumhaka Sutta of the Samyutta Nikaya. Words so true….some let flowers and sunshine go unnoticed…. What must be mine – welcome! What must not be mine – goodbye! Even if what must not be mine comes to show itself as gold; even what must be mine comes to show itself as straw! Well, from the Buddha’s point of view there is nothing whatever that can be called “mine,” so he’s advocating a complete letting go — just letting things pass through our lives without getting entangled with them. We have a deep and false sense of ” mine ” and ” not mine” ! We feel as owner of everything, even to our lover we say ” mine ” … But of course nothing is really ours! Even our bodies aren’t ours! Buddha for sure speaks in this quote about attachment! And ahead we will see that whatever it went away from us, this was a good thing! All attachment never was good to us! So, if we allow the things naturally come and go this will be really the best way to face life! Wisdom, deep wisdom! If you believe in annica, learn not to attach not only to the bad but to the good also.